How did you usher in 2014? I spent it at the Marina Bay Floating Platform at Celebrate TV 50 with Clarissa and Fiza. I did not know what to expect since there are over 200 MediaCorp stars and international acts such as The Wanted and Wang Lee Hom. I just had one word for the countdown, DISASTROUS. What meant to be a celebration turned into a boring show. The moshpit crowd was dead. People were seating instead of cheering for the acts. 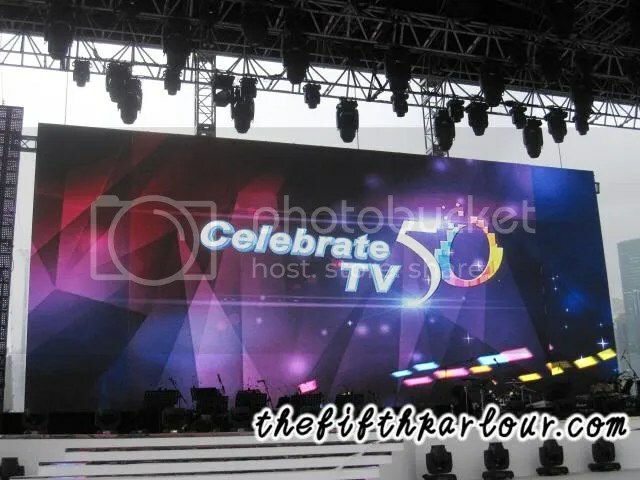 This year, MediaCorp, decided to combine the countdown with celebrate TV50. The objective is to end this year with a bang since it is TV 50 anniversary. However, if you study carefully, the target audience for both countdown and the celebration of 50 years of TV is way apart. Honestly, most of them were there just to support their own idols such as The Wanted, Wang Lee Hom and other local acts. If I were to give a suggestion to the MediaCorp team, I would suggest that they separate both shows. Celebrate TV50 should have its own prorgamme. One would want to seat in front of the television to reminiscence about the past shows instead of watching it during a countdown show. Adding on, I think the show should just be in one language. When the host conversed in Mandarin, I find myself wondering what is being talked out. I do feel left out when people around me started laughing. The highlight of the show for the Celebrate TV50 would be of course The Wanted while some would say Wang Lee Hom which I will talked about in the next post. Without them, I believed that most of the seats will be empty. Other acts will be the appearance of old characters from Growing Up, Phua Chu Kang Pte Ltd and Under One Roof. It was refreshing to see the characters aged after years of not seeing them. I still find myself laughing at their jokes. Taufik Batisah, the first Singapore Idol, still managed to catch everyone’s attention with his soulful voice and perfect move. Farisha Ishak, the winner of The Final 1, seems to be more comfortable on stage. In the past, I find her awkward on the stage but after seeing her live, it is great to see that she has become more confident on stage and has transformed into a performer. What sadden me the most is to see that local performers who were performing on the stage, had to go home on their own. I saw some of them walking with the crowd to their destination. If they can cater transport to international acts, why is the local performers not given the same treatment? !